Memorial Day is over, and the month of May is just about done too! Where did the time go! Father's Day will be here before you know it, so I've scoured the web to bring you my favorite Heartfelt Gifts for Dad. These are the gifts that are a little sappy, might make him shed a tear, but will definitely leave him feeling loved and appreciated. So get the kids involved and get to work! These Handcrafted Father's Day Trophies will Elementary Art Fun make any dad feel like a champion! Dad will love to display this on his shelf or desk! Have your children fill out this Father's Day Questionnaire from Daffodil Design, then type up and frame for a special keepsake. It's fun to see how their answers change from year to year! This I Love You Pillowcase from Mama.Pappa.Bubba for CBC is so sweet! Have your children write in pencil, and then you can trace it with a fabric marker. Make Dad feel special with these Awesome Dad Buttons from Disney Family! Dad will love reading these Best Dad Books from Eighteen25 year after year. It's fun to see how the answers change as the kids grow! Show Dad how much you love him with this I Love You card from Day In My Life! It's a great way to preserve those handprints. Dad truly is a King for a Day with this King Daddy Crown from 4 Crazy Kings. Personalize it with his favorite things! Dads are going to get ties, so why not make yours into a Tie Card from One Creative Mommy? Let the kids choose his favorite colors for each card. Or, you can use his favorite photos to make this Photo Collage Tile from One Creative Mommy. He'll love displaying all these beautiful pictures at once! Surprise Dad next time he opens his wallet with these adorable Gift Coupons from The Dating Divas! He'll love redeeming these for fun gifts and extra time with you! 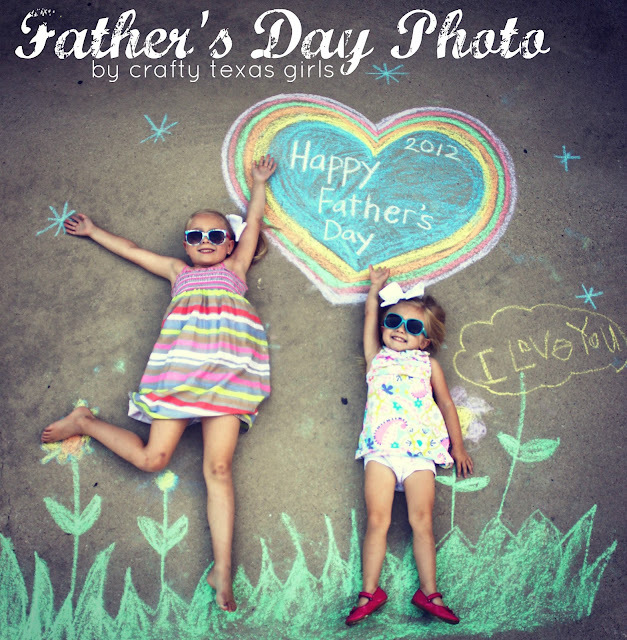 This Chalk Photo Idea from Craft Texas Girls is so sweet and fun! Have fun turning your driveway or patio into the perfect scene for a picture! This Free Printable from Catch My Party is the perfect background to preserve some special handprints. Simply use some fingerpaint, let it dry, and frame it up. Frame up a a meaningful quote with this Gold Frame by Lia Griffith. The masculine colors and feel make this the perfect gift to display in an office or at home. Time to print out those Instagram photos! Make this Daddy's Love Magnet Board from WhipperBerry and display all those photos you have on your phone! Let Daddy wear a special tie on Father's Day! Let your kids decorate their own Ties for Daddy from Make it and Love it, and he'll feel really loved. 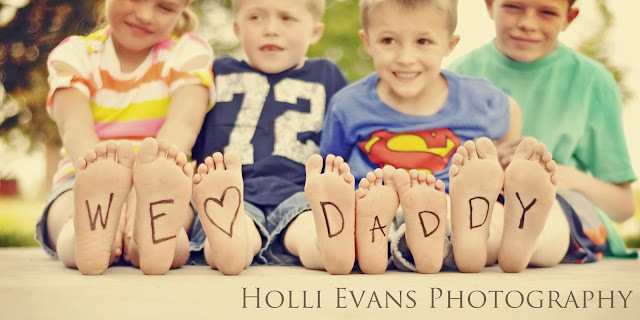 Here's another fun photo idea from Holli Evans Photography. If you don't have enough kid feet to spell it out, you can jump in with a Sharpie and a self-timer on a camera! If you want to give something handmade, but your crafting skills aren't quite up to par, consider making a special book like this one from Design Aglow. He'll love looking through it on a rough day. These Rustic Photo Frames from Shanty2Chic are perfect for displaying Dad's favorite photos and quotes. 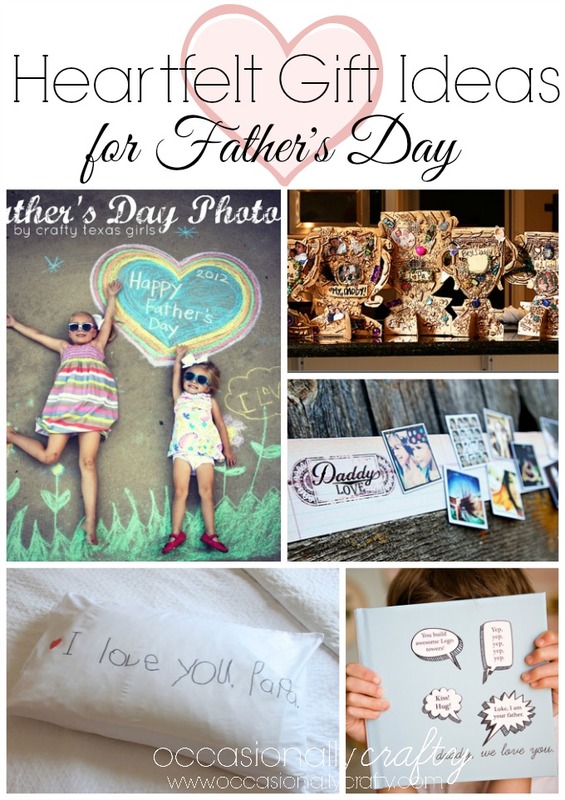 I hope you've found some fun ideas that will show Dad just how much he is loved. What are you planning on giving this year? DIY Autograph Book with MyPrintly + Giveaway!